Today I am having a play with a couple of blocks I made from tutorials. The first one is 'whirlygiggles'. I made a template from the instructions given by greeting arts. (thanks Annie)This is just some scrap fabric. I was thinking of sewing this in reds and white. The other block is called 'spools'. I saw this one on Karen's blog, (Mon. June 22, 2009). Her tutorial is great. Don't know what colours I'll use for this one. Can you see the blue 'treasures' ? A satin bowerbird has built a bower in our garden. He has been very busy collecting! Pop on over to Missie Krissie's blog to win this gorgeous handmade jewelry tree. 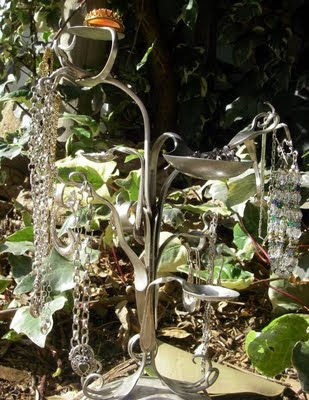 It is cleverly made from silver cutlery. It has a place to hold all your jewelry bit and pieces. Don't forget to mention you heard it here. Krissie also makes lovely jewelry too, check out her website. Here are some more photos from the weekend's camping trip. At night, the possums come out. (Sorry about the 'red eye' in the photos, I couldn't fix it). We had two brush-tail possums visiting. Uh-Oh!!! possum in the shower tent. Our friends had put their rubbish bags in their shower tent (zipped up), thinking that it would be secure. I think possum got in underneath. These guys are great at climbing, and can go straight up a gum tree. We went camping with friends at a forestry reserve called 'Peach Trees' on the weekend. It is near Kilcoy, S.E.Queensland. Set in a lush, green valley with a pretty creek flowing through. There were several groups of kangaroos grazing and lazing all around the camp. Awww... aren't they cute? Of course, I took some sewing with me. Here are some of the group around the campfire. We had beautiful crisp winter weather. The possums visit the camp at night, cheeky things! These ones are common brushtail possums and are about the size of a cat. You have to make sure your food is secure, if not , they will find it! This is the little garden project I was telling you about in the last post. I have converted an old concrete laundry tub into a little garden planter. It is now beside the back steps, and planted up with the strawberry plants, chives, thyme, mint and coriander. I like to have herbs growing close to the house, so I can quickly nip out and pick them fresh. Now I just have to wait for everything to grow. I took this last photo this morning (still in my pj's) and wearing my garden shoes. A nice spot to sit in the sun with a cuppa on a winter's morning.